I Found the Challah! | I Am Not A Restaurant! Here's what you do when you find the challah that your mother brought to celebrate on Friday night but that you forgot to set out because you hid it from thieving dogs. It seems particularly appropriate that the Medieval reference in France to stale soaked bread fried up in fat is “pain perdu” or “lost bread”. It's really a no recipe recipe but I shall list the ingredients anyway. Whisk everything but the bread. Soak bread slices, both sides. Melt butter in the skillet. Fry bread both sides. Serve with jam, syrup, honey or Nutella! 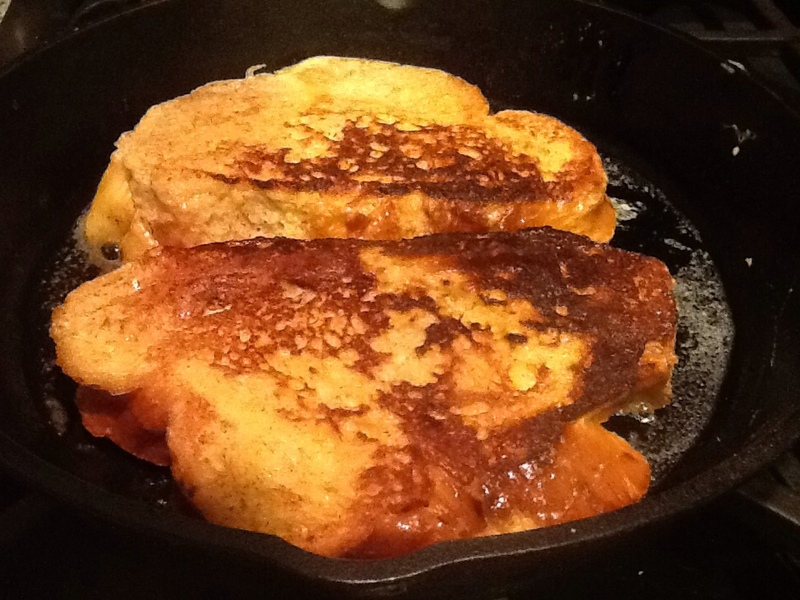 Dec5December 5, 2013 • By Betsy Karetnick • This entry was posted in Dish of the Day, French Toast, Kitchen Help, Recipes and tagged challah, French toast. Bookmark the permalink.